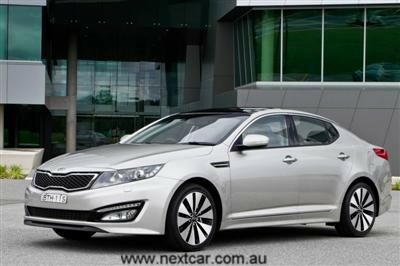 The new generation Kia Optima (formerly known as the Magentis in Australia) made its world premiere at the New York Motor Show in April 2010 and now it's about to arrive in local Kia dealerships. 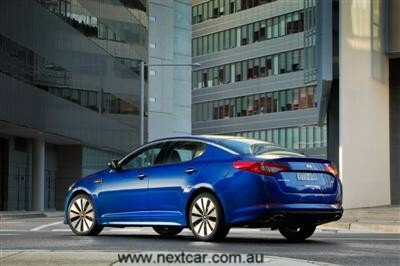 It is a completely new design of Kia's mid-size sedan. 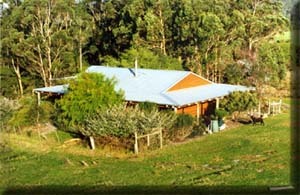 It is absolutely transformed, embodying a bold and yet sophisticated visual energy. Under the direction of Kia’s Chief Design Officer Peter Schreyer, the Kia design teams have now came up with a third-generation Optima that brings a new level of sophistication and refinement into the Kia product line-up. Longer, lower and wider than the previous generation model, the new Optima features a significantly longer wheelbase (up by 75 mm) and will offer much more space for people and cargo. While meeting all of the performance, styling and sophistication criteria demanded by the Australian market, the new Optima continues to deliver Kia’s cornerstone value with a MLP* of $36,990* (excluding the various statutory charges and dealer delivery fees). Kia’s product concept behind the making of new Optima had focused on four key areas. Stand-out styling – a unique exterior with a driver-oriented interior; class-leading performance – down-sized but more efficient engines with six-speed transmissions; superior packaging – new, longer wheelbase platform; advanced features – high-tech options to boost Optima’s status and Kia’s brand identity. The sedan which resulted from this product concept has been instantly embraced. Launched on the domestic Korean market in May 2010, new Optima was an instant ‘hit’ with monthly sales exceeding 10,000 units in June and July to claim the No. 1 family sedan position for Kia for the very first time. New Optima is significantly sleeker than the previous model, with an aerodynamic drag figure of Cd 0.29 (down from 0.32) – enhancing refinement, performance and fuel economy. 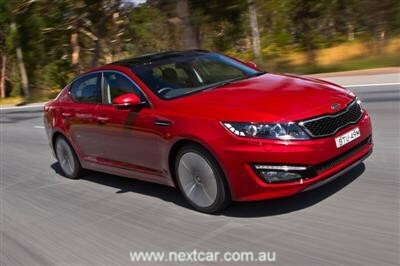 The new Optima is powered by a 2.4-litre Theta II unit with GDI (gasoline direct injection). The introduction of GDI technology, which represents the biggest advance in fuel injection technology since the 1980s, allows Kia to achieve three previously incompatible goals – lowering emissions and improving fuel economy, while also increasing the power and torque outputs to 148 kW @ 6,300 rpm and 250 Nm @ 4,250 rpm respectively. The new ‘Theta II’ engine features numerous design enhancements over its predecessor, with a two-stage variable induction system (VIS), Dual Continuously Variable Valve Timing (D-CVVT), upgraded electronics and low-friction components, while also featuring lighter construction. 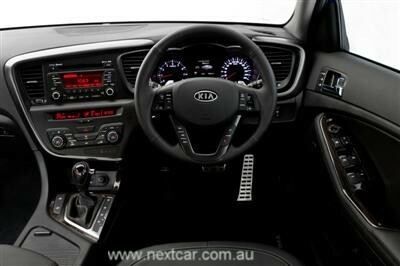 The Optima comes standard with a six-speed automatic transmission which offers two operating modes – fully automatic (ideal for city driving) or ‘Sport’ which allows for clutch-less manual sequential gear changes for greater driver involvement – using either the centre console selector lever or the new steering wheel-mounted ‘shift paddles’. The new Optima comes packed with a long list of premium features including smart key with push button start, anti-theft immobiliser, leather trim with wood-look interior, heated 4-way power front passenger seat and heated and ventilated 8-way power driver’s seat with a 2-position memory, cruise control with steering wheel mounted controls, 7-function trip computer, height and reach adjustable steering wheel, alloy sports pedals and cooling glove box. Interior comfort is maintained by dual-zone automatic climate-control air-conditioning with floor console mounted rear air vents. The seven-speaker MP3 compatible CD player, AM/FM radio sound system with iPod and Bluetooth connectivity is operated by steering wheel mounted controls. Exterior features include panoramic electric sunroof, window tinting, dusk sensing HID type front headlamps with washer, body coloured sport bumpers, door handles and outside electric door mirrors (heated) and LED daytime running lights (DRL). New Kia Optima presents buyers with a range of state-of-the-art active and passive safety systems and equipment as standard. Available ‘active’ safety technologies to help Optima drivers avoid potential accident situations include ESC (Electronic Stability Control), TCS (Traction Control System), BAS (Brake Assist System) and a new system – HAC (Hillstart Assist Control). A new rear-view camera is fitted to assist drivers during reversing manoeuvres. The camera uses a wide-angle lens to transmit images to an LCD display set within the interior rear-view mirror. Simultaneously this system enables the driver to check the rear view and the blind spot immediately behind the car. All Australian bound Optimas will be supplied from Kia’s Hwasung factory in Korea and will be available in seven exterior colours: Snow White Pearl, Bright Silver, Ebony Black, Platinum Graphite, Satin Metal, Santorini Blue and Spicy Red. The first-generation Optima/Magentis was introduced in 2001 and the second, which marked a huge step forward for Kia, in 2006. Over the next four years, it attracted thousands of customers who had not previously considered buying a Kia, and achieved global sales of more than 110,000 units in 2009.